Elemental Creation -GITADO ROCK ver.-'s jacket. 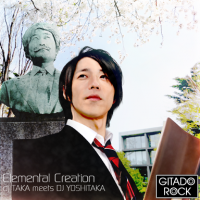 Elemental Creation -GITADO ROCK ver.- is a rock arrangement of Elemental Creation. Elemental Creation -GITADO ROCK ver.- is the final Shiritsu BEMANI gakuen (私立BEMANI学園) song. To unlock it, you must first have unlocked all the other 9 Shiritsu BEMANI gakuen songs, and then obtain 100% of Friendship on dj TAKA and DJ YOSHITAKA. After the event ended, it could be automatically unlocked in GITADORA after having unlocked a currently unknown number of 私立BEMANI学園 songs. From GITADORA OverDrive onwards, it is available by default. Elemental Creation -GITADO ROCK ver.- marks the first new song appearance by DJ Yoshitaka in GuitarFreaks & DrumMania since 幻想花 back in GuitarFreaksXG & DrumManiaXG. In jubeat, Elemental Creation -GITADO ROCK ver.-'s BASIC chart has the second highest number of notes of a BASIC chart with 586 notes, only beaten by Megalara Garuda's 932. When Elemental Creation -GITADO ROCK ver.- was first released, its jubeat EXTREME chart was bugged due to the bonus score calculation formula. The player would be required to get at least 1024 out of 1038 notes to be a PERFECT or GREAT with a full combo or 1031 PERFECT or GREAT with 1 MISS to get a full bonus score. This was later fixed.